All ages. All skin types. There’s an Obagi for everyone. Obagi products are designed to minimize the appearance of premature skin aging, skin damage, hyperpigmentation, acne, and sun damage. 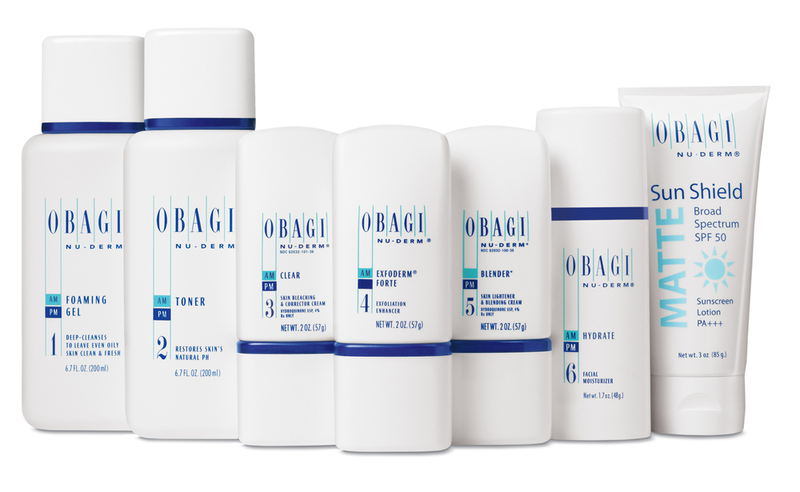 Obagi skin care products contain prescription-strength formulations and are available only through physicians, medical spas, and other skin care and medical professionals. The only way to ensure your Obagi product is genuine is to purchase it through one of these authorized channels. Glo Therapeutics offers a systematic approach to treat multiple skin concerns by incorporating home care programs and professional treatments. Utilizing innovative technology and the latest developments in the industry’s science, advanced formulations are created with potent concentrations of active ingredients to clinically transform the skin. Clarisonic makes a guarantee that it will transform your skin! Clarisonic has the power to remove 30x more age accelerating pollutants than cleansing with your hands. The photos below show oil on the face before cleansing, and then compare cleansing with the Clarisonic to cleansing manually. Pretty amazing! No matter what your concern, Clarisonic will help. Everyone should own a Clarisonic! The VI Peel truly renders every other peel obsolete. VI Peels are a safe, effective approach to achieving younger looking skin and provide superior results for all Fitzpatrick skin types. Two to four VI Peels per year, along with proper home care, reverses sun damage, treats hyperpigmentation including melasma, acne and acne scarring, aging skin and rosacea. Patients of all ages will benefit from these treatments, from pre-teen acne to mature patients wanting to reverse the signs of aging. Unlike other chemical peels, VI treatments are virtually painless, require no skin preconditioning and have minimal downtime. The peels are suitable for the face and body. The VI Peels are practical, affordable and give excellent results within one week.